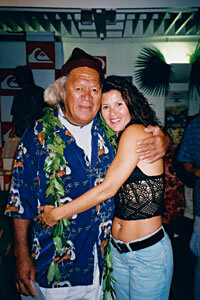 Buffalo Keaulana "2005 Surf Pioneer"
PHOTO: Buffalo and The ActivEmpire's Leila Endersby at the 2003 Quiksilver ASP Masters held at Buffalo's Makaha. PHOTO: Buffalo accepting induction 2005. Richard “Buffalo” Keaulana Patriarchal Hawaiian Surfer/Lifesaver and Son of MakahaIt’s good to be the Mayor of Makaha, especially when you’ve given rise to a West Side dynasty now in its third generation. Richard Keaulana was born (1935) in Honolulu, his family settling in Makaha while he was still a young boy. 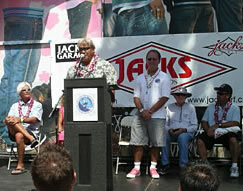 He learned to surf in the gentle rollers off Waikiki, eventually graduating to the level of beachboy during the 1950s. Dubbed “Buffalo” by friends due to a large head covered in copious amounts hair the color of adobe, he was considered one of Hawaii’s most naturally-talented surfers. His smooth style, switch-stance skills and nose for the pocket made him an annual favorite at the Makaha International contest, an event he won in 1960 (Keaulana captured six top four finishes in the contest between 1957 and 1965). Built with the sturdy frame of a Polynesian warrior, he was also considered by many at the time-including Greg Noll-to be the world’s best bodysurfer. 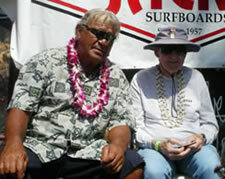 A consummate waterman, Keaulana was named Makaha’s lifeguard chief in 1969, a position he managed for the next two and a half decades (in 1972 local officials erected a statue in his honor in front of a library near Makaha). Buffalo’s Big Board Classic—a surf contest and beach party held at Makaha is now in its 28th year and has become a community mainstay. Two of his six children have gone on to noteworthy careers in surfing: Brian, a world class waterman and big wave surfer; and Rusty, a three-time world longboard champion (1993-95).